Release notes help to keep you informed of the latest features and enhancements that are intended to improve your CardPointe experience. CardPointe release version 1.37 includes security enhancements to prevent fraudulent activity. Multiple attempts to log into your account with incorrect credentials will result in a temporary (30 minute) lock on your account. Continued attempts during the lockout period add 30 minutes each to the duration of the lockout. Additionally, changing your password while your account is locked does not cancel or otherwise affect the lockout period. Instead, you can log in with the new password once the lockout period has ended. If you are locked out of your account and cannot regain access, contact support for assistance. In addition to printing receipts, you can now save them as PDF files. On the Transaction Detail page, click Print Receipt. Select the Save as PDF option to download the receipt as a PDF. 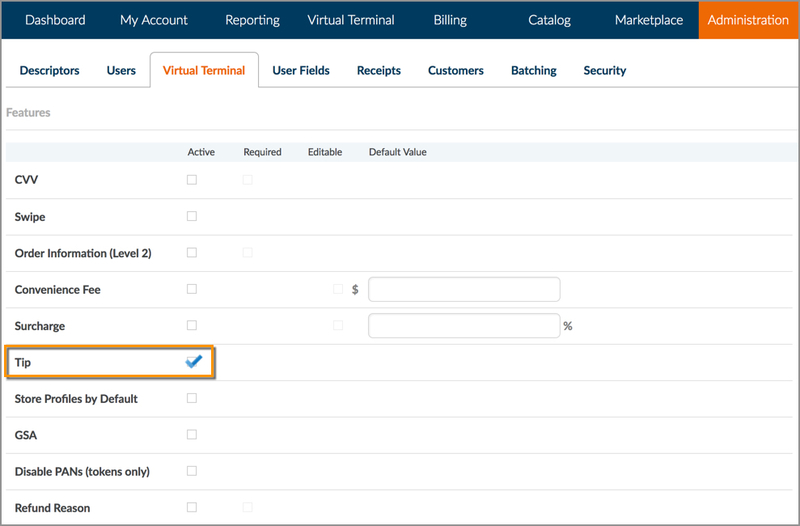 If you currently capture the customer's country in the Virtual Terminal sales form, you can now configure a default value to pre-fill this field. On the Administration page, select the Virtual Terminal tab. On the Virtual Terminal tab, scroll down to the Customer Settings. Ensure that the Country option is set to Active, and select a value from the list in the Default Value column. 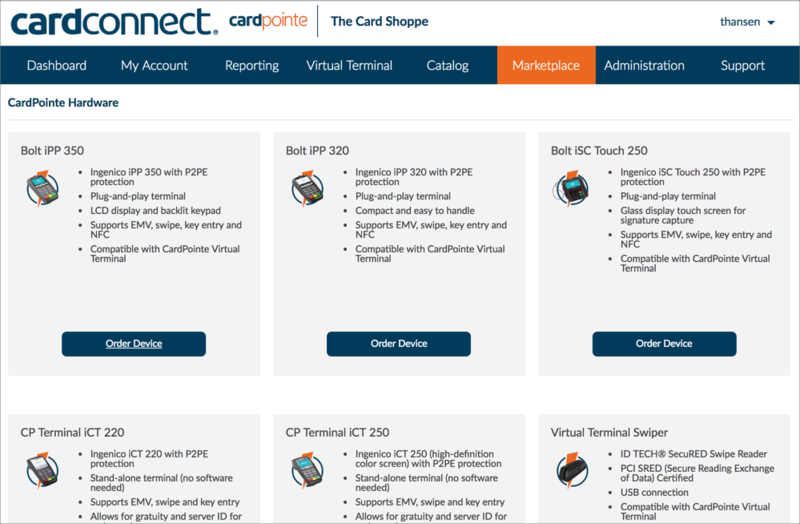 The CardPointe Marketplace is your one-stop shop for terminals, add-ons, and plugins for CardConnect. We've given the Marketplace a refresh to make it easier to browse our current product offerings. Check out our new Marketplace support page which includes a new addition to the Marketplace family: Clique. To access the Marketplace, simply log in to CardPointe and navigate to the Marketplace tab. 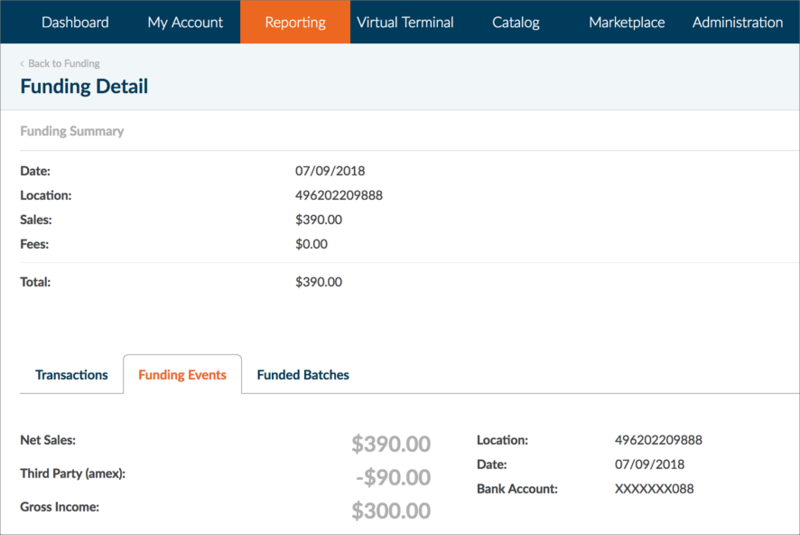 Choose a date from the "Funding Date" column to display the Funding Detail screen. Select the Gateway Batches tab. 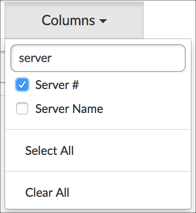 Choose a Batch Number from the table to display the Batch Detail screen. Select the Date filter at the top of the table to select a range of transaction dates to filter on. 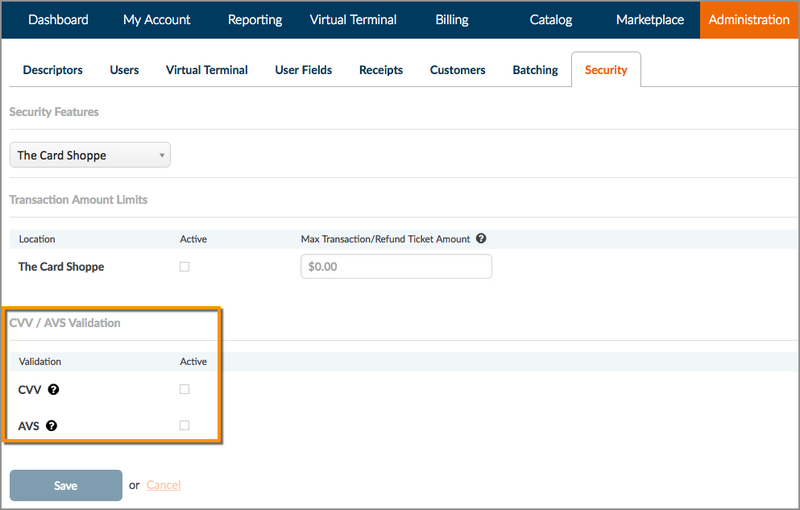 Attention restaurant and other service-based merchants - you now have the ability to filter your transactions reports by "Server #." This field, also commonly known as “Clerk ID” on CardPointe terminals, is used by merchants who wish to assign their employees unique identifiers for reporting and tracking purposes. This practice is commonly used in a restaurant environment so that servers can track their net sales and tips. As such, CardPointe terminals that are programmed with a restaurant configuration now have this field enabled by default. From the main screen, press # to display the Admin Menu. Press 2 to display the Clerk Menu. Press 5 for Clerk Prompt. Select either 2 for ID only, or select 4 for ID and Name. Additionally, you can contact CardPointe Support for assistance. When the "Clerk ID" field is enabled, the terminal will prompt you to enter either the Clerk ID, Server ID, or Cashier ID before entering a sale amount, depending on your preference. To add this filter to your reports in CardPointe, navigate to the Reporting > Transactions screen, click the Columns dropdown and check the box next to Server #. As transactions accrue on your terminal(s), you can refer to this field in your reports to view transaction activity for a particular clerk, server, or cashier. To learn more about Reporting in CardPointe, check out the CardPointe user documentation. CardConnect for Magento enables you to accept Visa, MasterCard, American Express and Discover payments in your Magento shopping cart. The plugin tokenizes sensitive data, safeguarding your customers from a data breach and removing the burden of PCI compliance. You can learn more about the plugin by accessing the Marketplace in CardPointe. For additional details, please refer to the CardConnect for Magento user documentation. Transactions made with debit cards now display as PIN Debit in the Payment Type field on the Transaction Details screen, as well as in CardPointe Reporting. 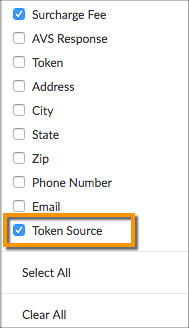 A new field titled "Token Source" now displays on the Transaction Details screen and can be referenced to determine the payment device or method that was used for tokenizing a customer's card data for a given transaction. 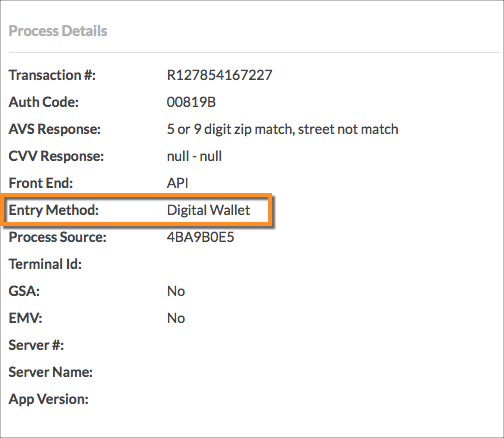 Transactions made with digital wallet apps such as Apple Pay and Google Pay now display as "Digital Wallet" in the Entry Method field on the Transaction Details screen. To add these filters to your reports, navigate to the Reporting > Transactions screen, click the Columns dropdown and check the boxes next to the desired options. 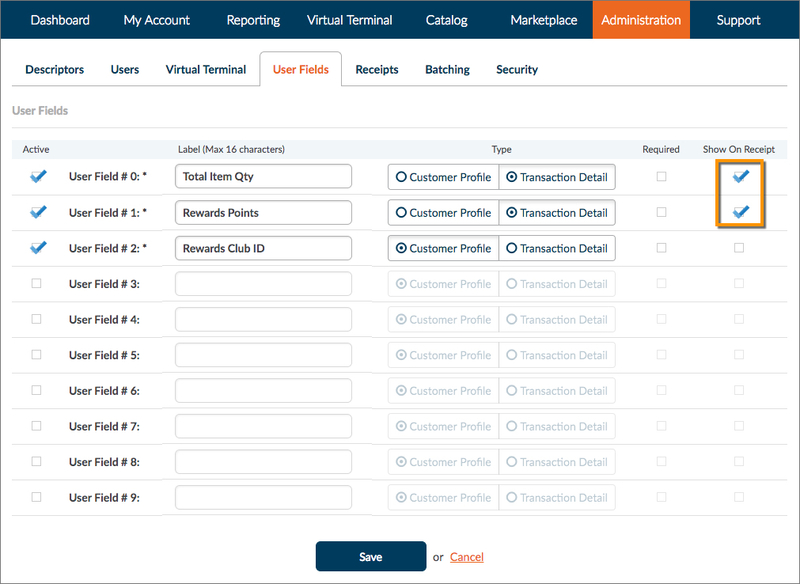 In CardPointe, you can define up to 10 custom fields that allow you to capture additional information about your customers and your transactions. In this release, we now provide you with the ability to choose specific custom fields that you wish to display on receipts. 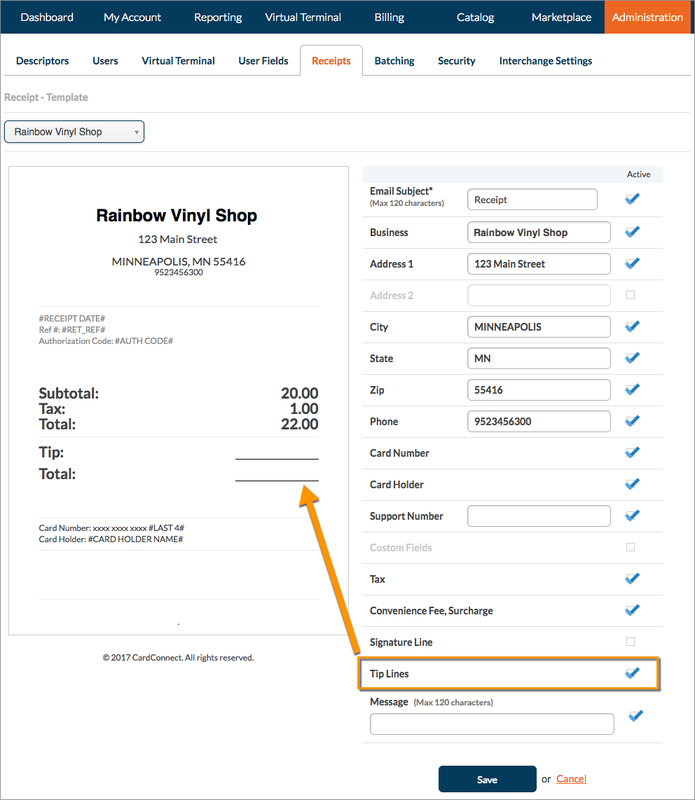 To display Custom Fields on receipts, you just need to click a few boxes in CardPointe. First, let's navigate to Administration > User Fields and locate the fields that you wish to display on your receipts. Simply click the boxes in the "Show on Receipt" column for any fields that you wish to display on receipts. Next, you just need to enable Custom Fields on your receipts. 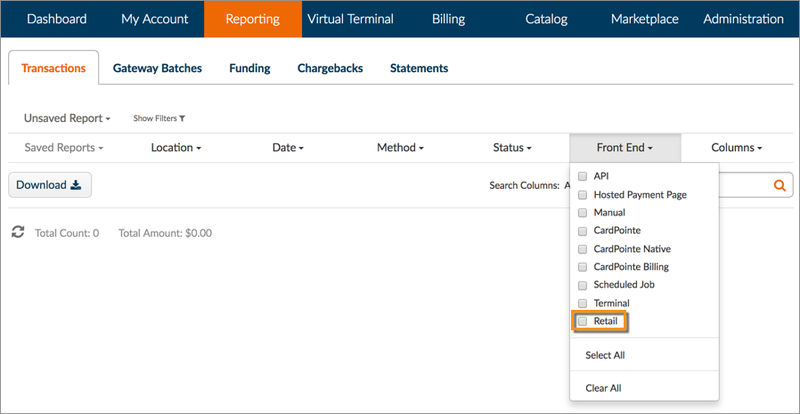 Navigate to Administration > Receipts and click the box next to Custom Fields. The Custom Fields that you selected now display on your receipts. Previously when using the Virtual Terminal, if the customer's address was in the United States, you had to manually enter the name of the state which sometimes led to errors. Now, when "United States" is the selected country, a drop-down menu appears allowing you to easily select the customer's state from the list. 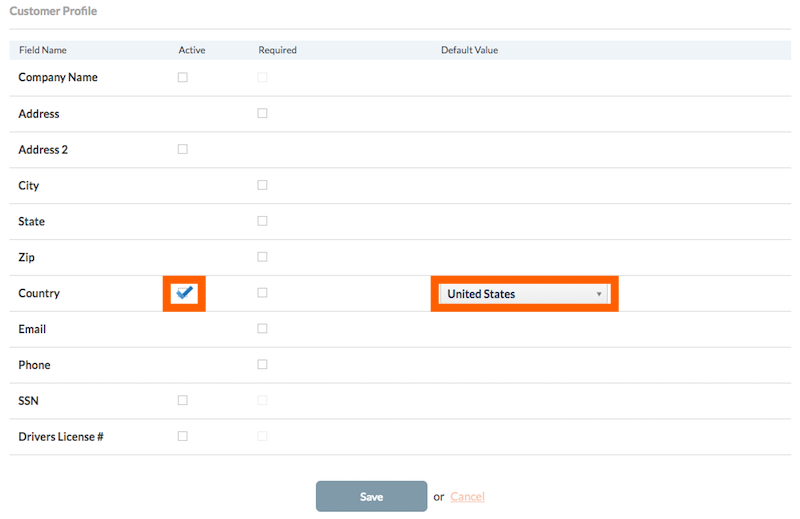 If any country besides the “United States” is selected as the customer's country, then a text field displays allowing you to manually enter the state or province. We've added a currency indicator next to the "Total" field within the "Transaction Details" section of the Virtual Terminal. This makes it easier to distinguish between the currency type if you manage merchant locations in multiple countries. To add these filters to your reports, navigate to the Reporting > Transactions screen, click the Columns dropdown and check the boxes next to these options. CardPointe now validates bank routing information as it is provided in real-time for businesses located in the United States. When a merchant or sales partner enters bank routing information into the CardPointe application, CardPointe performs a check and indicates if the routing number is valid or invalid. You can now create and save a customer profile in CardPointe by simply swiping the customer's payment card. This functionality currently supports USB swipers only. Bolt terminals are not supported at this time. 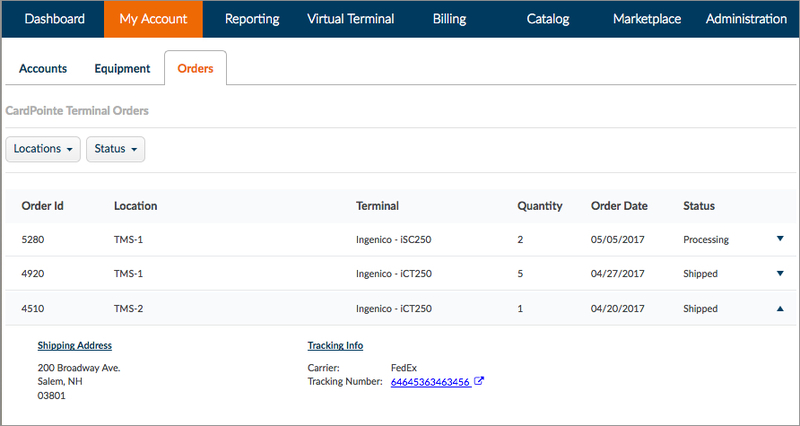 Navigate to the "Virtual Terminal" screen and click the Customers tab. Click Device/Terminal Card Entry on the right side of the screen. Using your terminal, swipe the customer's payment card. CardPointe performs a verify against the card to determine its validity. If the card is verified successfully, click Save Account to automatically save the customer's profile in CardPointe. If the card verification is unsuccessful (i.e. 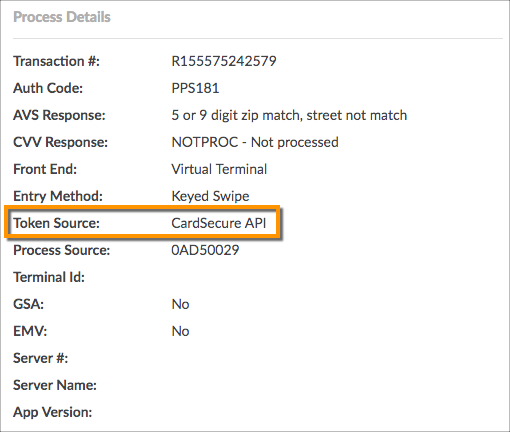 ; card was declined), you cannot save the customer profile in CardPointe using this method. Need assistance with CardPointe or have questions about your hardware? We have your back! You can contact our Support team by submitting a support ticket without having to leave the CardPointe application. To learn more, please refer to the user documentation on this site. Previously, when merchants registered for a CardPointe account, they then needed to manually enter their login credentials to access the CardPointe application. Now, a merchant is automatically logged in to CardPointe upon registering for an account. You can now view transaction details related to ACH returns by navigating to the Reporting > Transactions screen. 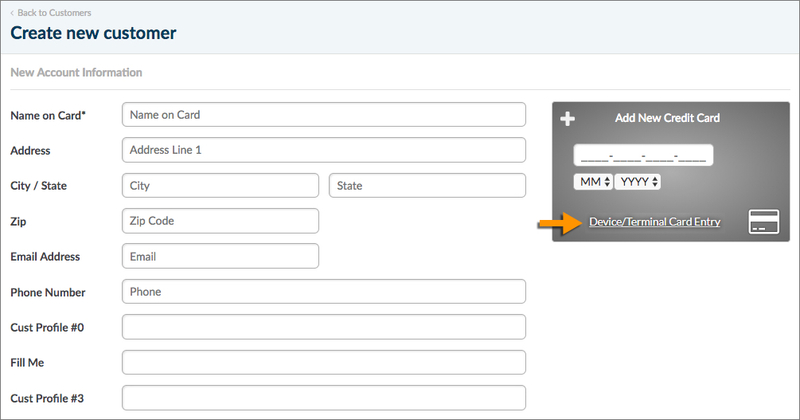 To show ACH Returns transactions, select the Method dropdown and check the box next to ACH Returns. 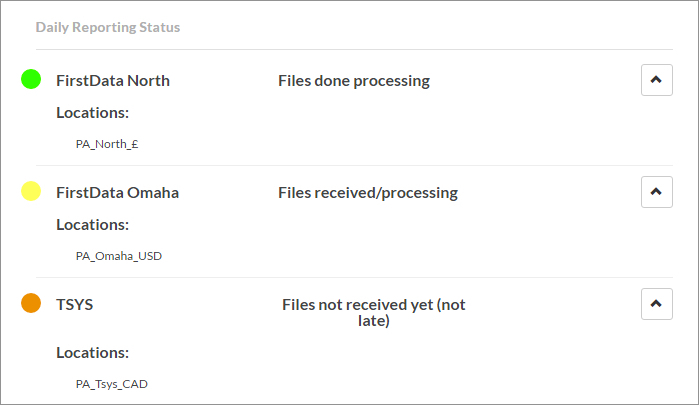 You can now add "Settlement Date" and "Capture Date" information to Transactions reports. On the Reporting > Transactions screen, click the Columns dropdown and check the boxes next to these options. We moved the "Billing Plans" and "Scheduled Payments" features to the Virtual Terminal tab. If you wish to create a new billing plan or view an existing billing plan(s), navigate to Virtual Terminal > Billing Plans. If you wish to view your past and future scheduled payments, navigate to Virtual Terminal > Scheduled Payments. Previously, when a transaction was declined, the sales receipt did not display that a decline occurred. 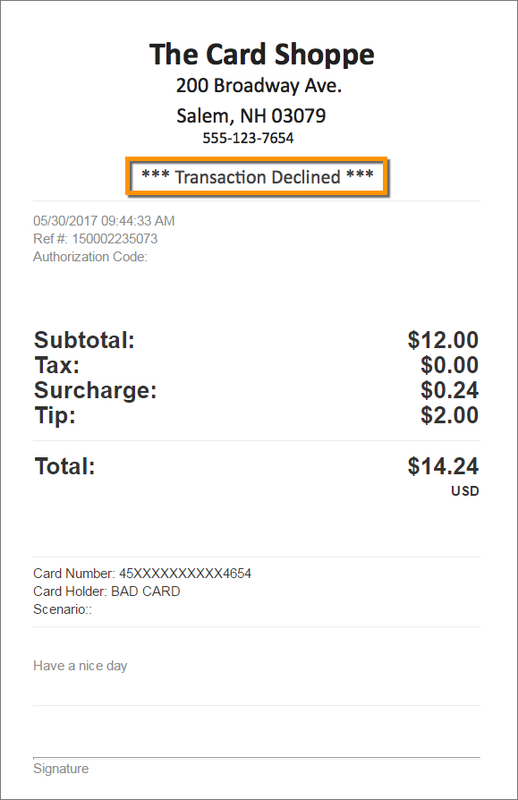 Now when a transaction is declined, the receipt displays "Transaction Declined" above the transaction details. Note: Devices that were ordered prior to the introduction of this feature will not appear in the list of devices on the Equipment tab. You can now configure the default Level 1, Level 2, and Level 3 Interchange levels within CardPointe by navigating to Administration > Interchange Settings. Note: To take advantage of this feature, please contact your sales partner. Your sales partner must activate this setting for you before it will display in CardPointe. 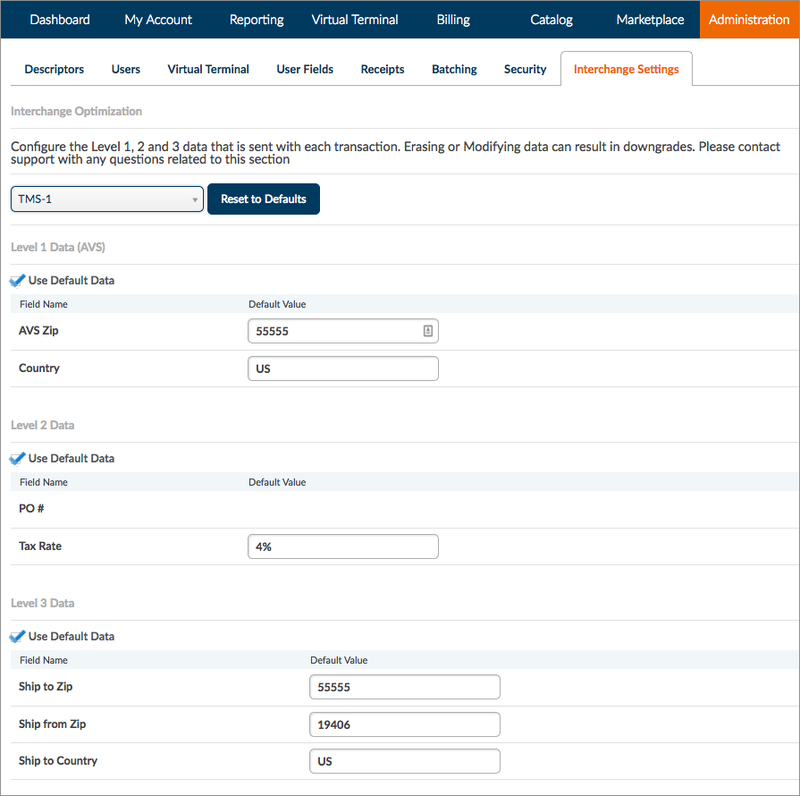 Enable and disable Invoice, PO, and Tax on the Virtual Terminal and on the Transaction Details screen. 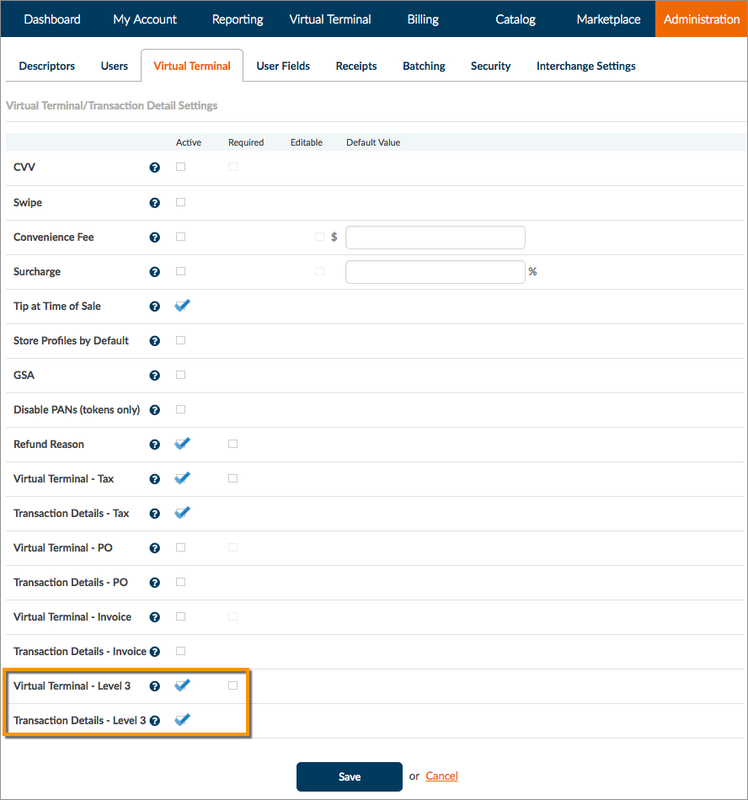 To enable these fields, navigate to Administration > Virtual Terminal and check the boxes next to Virtual Terminal - Level 3 and Transaction Details - Level 3. Enabling these settings adds Level 3 data fields to the Virtual Terminal and to the Transaction Details screen. We made it easier for merchants to quickly and securely link their bank account(s) during CardPointe account registration. By partnering with Plaid, we now provide you with the ability to link your deposit and withdrawal account(s) without having to manually enter your account and routing numbers, and without having to upload a voided check. During the CardPointe registration process, you can click the Link My Account button to instantly link your bank(s). Note: If you do not wish to take advantage of this new feature, you can manually enter your bank account information by clicking Enter Manually. Please be aware that the manual method takes longer since micro-deposits must be made into the linked account(s) and you must confirm the deposits before the accounts are ready for use with CardPointe. You can now enter a dollar amount threshold for Address Verification System (AVS) mismatches. Transactions that fall under the defined threshold dollar amount will be authorized and voided in the event of an AVS mismatch. Transactions that are over the defined threshold dollar amount will be verified before an authorization is attempted. If zero is entered for the threshold dollar amount, then all transactions with an AVS mismatch will be declined. To define an AVS mismatch threshold, navigate to Administration > Security. Merchants that have the “Tip Adjust” setting enabled on their account now have the ability to add a “Tip” line that will display on receipts. This allows customers to write a tip amount as well as the total purchase amount on the receipt after the transaction is captured. Note: If you wish to accept gratuity after a transaction is captured via the "Tip Adjust" feature, please contact CardPointe Support to have it enabled. This is required before you can add a tip line to your receipts. Navigate to Administration > Receipts. Check the box next to Tip Lines. Click Administration and select the Users tab. Locate and select the desired user account. Check the box next to Funding Report Daily Alert. Note: This feature works in conjunction with the Daily Reporting Status feature that was released in CardPointe 1.23. This bug fix resolves an issue that caused the “Voided Check” upload button to not display as expected on the CardPointe application Review & Sign screen. Note: File processing statuses reset daily at 12:00am EST. Click the Front End filter. Click the box next to Retail. This will display all transactions made via CardPointe Terminals. Note: The “Retail” option displays transactions specific to CardPointe Terminals, whereas the “Terminal” option displays transactions made with non-CardPointe Terminals. 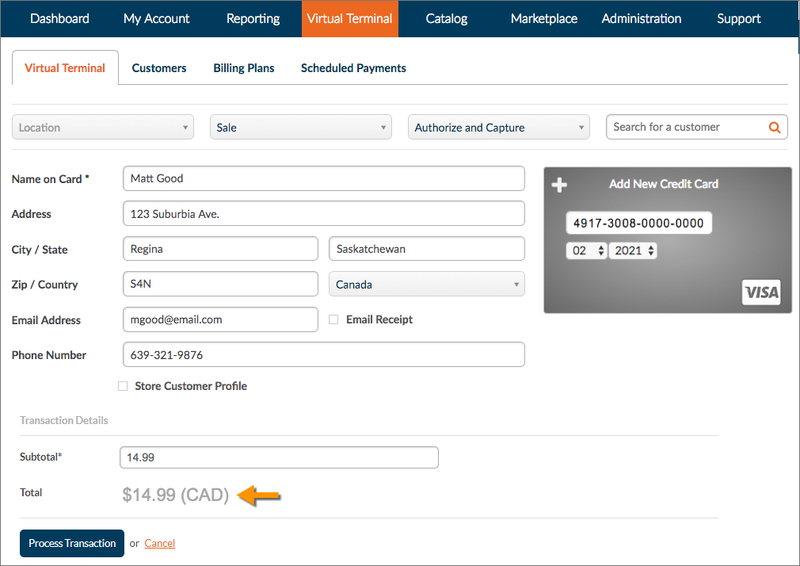 The "Virtual Terminal" tab within the Administration section of CardPointe now contains settings for Virtual Terminal features, as well as Customer Profile settings (which appear on the Virtual Terminal screen in CardPointe). Previously, Customer Profile information displayed in a separate “Customers” tab. For details on how to setup and manage your Catalog in CardPointe Desktop, please refer to the user documentation on the Support Center. For details on how to setup and manage your Catalog in CardPointe Mobile, please refer to the Mobile app user documentation on the Support Center. Click the Virtual Terminal tab. Check the box next to Tip. Merchants with a restaurant MCC code can now accept gratuity after a transaction is captured. When a transaction is in “Captured” status in the CardPointe desktop application, a “Tip Adjust” field displays on the “Transaction Detail” screen, providing users the ability to enter a tip amount before the sale is final. Clicking Tip Adjust displays a pop-up that allows you to input the tip amount. Within the “CVV / AVS” section, check the box next to the desired validations that you wish to activate. CVV (Card Verification Value) - When active, CVV mismatches are automatically declined. AVS (Address Verification System) - When active, AVS mismatches are automatically declined. Customer signatures now display on receipts, as well as on the “Transaction Details” screen.